President Pranab Mukherjee on Sunday inaugurated the new integrated terminal at Netaji Subhas Chandra Bose International Airport. Mukherjee praised the new facility as a hall mark of excellence that the public sector can achieve. "I congratulate the AAI (Airports Authority of India) and the civil aviation ministry for such a great work. I believe there is no conflict between the public and private sectors. The question is how efficient it can be," Mukherjee said. Communist Party of India (Marxist) leader Sitaram Yechury, who also attended the event, lost no opportunity to claim credit. "Because of the Left, UPA-1 (United Progressive Alliance) was forced not to give the airport to private players. Mukherjee, too, was part of that government. Today, he acknowledged that the public sector, too, can deliver the highest level of efficiency," said Yechury. AAI had hired a Thai-Indian consortium, Italian-Thai Development Public Co. Ltd(ITD)-ITD Cementation, to build the airport. According to Civil Aviation Minister Ajit Singh, a Kolkata-Delhi-New York AirIndia flight will mark the commencement of operation of the new terminal on Wednesday. 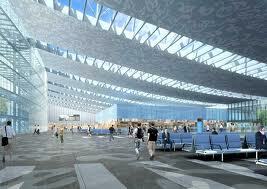 Initially, the new terminal will be used only for international flight operations. Airliners will shift their facilities from the existing terminal to the new one in a phased manner. Although West Bengal Chief Minister Mamata Banerjee asked the AAI to make new facility fully operational in another 15 days, officials said this could be done only by the end of March 2013. After the entire operations shift to the new terminal, the existing international terminal in Kolkata airport will be closed. The area will be used for future expansion of the airport. The state-of-the-art integrated terminal has been built at a cost of Rs 2,325 crore (Rs 23.25 billion). Apart from the 195,000-sq. metre, five-level integrated passenger terminal building, the new facility also offers modern taxiways and extension of a runway, so that it can handle bigger aircraft such as the Airbus A-380. The AAI will not charge airport development fee from passengers at the new facilities in Kolkata and Chennai, where the modernised new terminal is slated to be inaugurated on January 31. "There will be no ADF in Kolkata and Chennai airports. The AAI have the financial backbone to afford the cost escalation in modernisation of the two airports," said AAI Chairman V P Agrawal. Incidentally, the AAI had earlier proposed to levy a development fee of Rs 300 per embarking domestic passenger and Rs 1,000 per embarking international passenger at both the airports. The plan was later dropped following the directive from Civil Aviation Minister Ajit Singh. With the launch of the new terminal, four international airlines have shown interest to operate to and from Kolkata. "Gulf Air, Japan Airlines, Turkish Airlines and FlyDubai have shown interset for Kolkata operations. "They have sent preliminary queries to us," said B P Sharma, director of Kolkata airport. Out of the four airlines that have evinced interest, three may soon start operation soon, said officials. It would take a longer time for FlyDubai because it has exhausted its flying rights to India, the officials added. Among the foreign airlines that currently operate out of Kolkata include Emirates, Qatar Airways, Singapore Airlines, Thai Airways, AirAsia, Druk Air, SilkAir, China Eastern Airlines, United Airways, GMG Airlines, Biman Bangladesh Airlines and Dragonair.